Aloe Vera is a magical gel that can help the skin hair and health in general. Aloe gel packs and masks can do wonder for most of the skin related problems like skin irritation, skin darkening, boils, cuts, wounds etc. Aloe vera gel loaded packs can also make skin supple by preventing dry patches. Aloe gel can be mixed with some other herbs to make aloe vera face packs and masks which can prevent acne and pimples from the face. 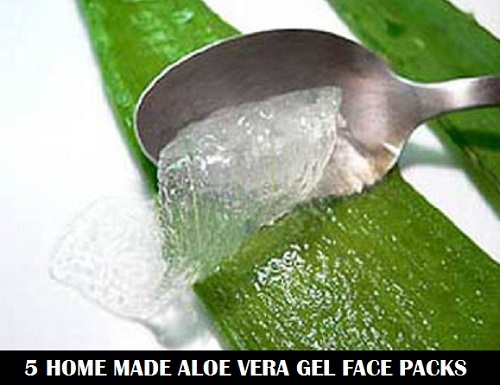 Here are 5 homemade aloe vera gel face packs for different skin types. Take a small piece of papaya and one teaspoonful of aloe vera gel and mix both of them. Once you mixed both the ingredients thoroughly. Apply this papaya and aloe vera gel face pack on the face. Wait for 20 minutes and then wash your face with plain water. Neem, tulsi and aloe vera gel face pack is ideal for teenagers who are struggling to get rid of pimples and acne. This can be also tried by the grown ups who are facing adult acne. Take 10-12 neem leaves, 10-12 tulsi leaves and a tea spoonful of aloe vera gel. Crush the leaves and mix them with the aloe vera gel. Apply this gel like paste on the face and wait for 20 minutes. Rinse off the face after 20 minutes with plain water. 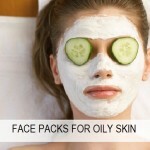 This face pack should be used at least 2 times in a week to get the maximum benefits. 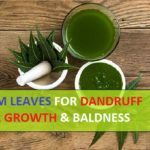 Neem and tulsi (basil) leaves are antimicrobial and hence kill the acne causing bacteria while aloe vera gel keeps the skin hydrated. 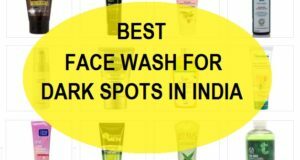 This face pack heals the skin and fades pimple marks. This homemade aloe vera gel face pack with besan (gram flour) with some turmeric powder, is good for getting fair clear skin. People who have sun damaged skin and dark spots should also try this pack to control that problem. It can also give relief in hyper-pigmentation. Take a teaspoonful of besan, a teaspoonful of aloe vera gel and 2 pinches of turmeric powder. Mix the 3 ingredients well to get a smooth paste. Aloe vera gel and besan mixes up well so there should not be any problem. Apply this and rinse after 20 minutes. Use this thrice in a week for best results. This face pack is highly beneficial. Aloe vera gel also has the skin lightening properties without skin drying. Besan is also known to lighten the skin tone and turmeric is a powerful antioxidant as well as widely known to lighten complexion. Another aloe vera gel face pack that can be made at home is with coconut water. Coconut water gives the skin glow and shine and also gets rid of the sun tan and darkness. Coconut water is very good to lighten the skin tone and when it is mixed along with the aloe vera gel, it forms a good face pack for skin lightening and rejuvenating the skin. Take a teaspoonful of aloe vera gel and mix half a teaspoonful of coconut water. This will not be a paste but of a runny consistency. 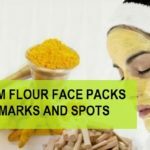 Massage the face with this mixture and then wait for 20 minutes. Wash the face with plain water. This can be done every day to remove dark spots, marks and sun burning as well. Dry skin in winters becomes hard to manage with dry patches. This sandalwood and aloe gel face pack is very quick to make and shows good results when used 2 times in a week. Sandalwood heals and soothes the skin while aloe vera gel revives the dull, dry skin, hydrates it by providing sufficient moisture and also makes skin fresh and supple. Take 2 teaspoonful of sandalwood powder with a teaspoonful of aloe vera gel. Mix everything well and then apply on the face evenly. Let this get dry for 30 minutes. Then wash this off with plain water. These aloe vera gel facial packs are quick and easy to prepare at home and as mentioned, these face packs will give you good results. It is recommended and suggested that you should use freshly extracted aloe vera gel instead of using a store bought aloe vera gel as that may contain other chemicals and preservatives. Extracting aloe vera gel is easy, just take out the outer green part and inside you will get the fresh aloe vera gel. Using the fresh gel will give immense benefits than the store bought one, if you do not have the plant at home. You can use the aloe vera gel brands available in Indian market. 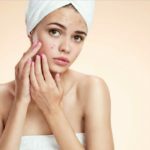 Can I use aloe vera gel wth store bought neem paste and dried tulsi powder for spot treating my acne ? Yes, Sana you can use that but if possible try to get the neem powder since neem paste will still have some preservatives. Neem powder is easily available. Try steaming for 5 minutes once in a week and use a neem based face wash like garnier neem face wash. Use scrub 3 times in a week, This will clear the skin and keeps the pores clean which causes pimples. As the pimples on your skin is due to blocked skin pores. Do not use aloe vera based cream as they are not suiting you. Use clindamycin phosphate gel at night to heal the pimples. For that I would advice you to visit and see a hair specialist. Aloe vera with besan is really amazing. It does give instant glow on the face. I always apply it before going to a party.